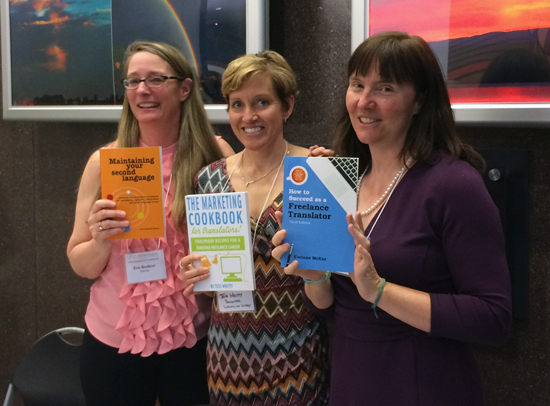 Last weekend we attended the 6th Annual Conference of the Colorado Translators Association. I enjoyed the conference: all the sessions I went to were interesting, useful, and well presented. I saw again friends and colleagues I’ve known for years, and met new people. Two of my current students were at the conference; I think they found it worthwhile. I also saw students from earlier courses, now well launched on their translation careers. Three interesting books were on sale at the conference: Eve Lindemuth Bodeux’s Maintaining Your Second Language (“practical and productive strategies for translators, teachers, interpreters and other language lovers”); Tess Whitty’s The Marketing Cookbook for Translators (“foolproof recipes for a thriving freelancer career”); and the 3rd edition of Corinne McKay’s How to Succeed as a Freelance Translator. The first session we attended on Saturday was “Future-Proofing Your Translation Business”, the keynote on marketing given by Tess Whitty on strategies for a thriving career as a freelancer. Tess spoke of protecting and improving our business assets (especially our translation skills), investing in continuing education, time management, mind-sets to avoid (for example atelophobia, the fear of not being good enough), and goal settings: 95% of people don’t write down the goals they set for themselves. The remaining 5% are those who do reach their goals. The next presentation was “Creating a Compatible Customer Base within the Language Services Industry”, by Karen Tkaczyk, on how to get a better class of clients. The main takeaway for everyone here was that the “ideal customer” doesn’t exist, and that we should aim instead at assembling an ideal basket of good customers. “Automating Termbase Creation”, by Sameh Ragab (who came to Boulder all the way from Egypt just for the conference), was a must-go presentation for anyone interested in translation tools. Sameh answered the question “Why is terminology important?” by saying that good terminology helps make our translations more clear, consistent and easier to review, thus achieving faster turnaround. Good terminology increases brand value, both for clients and for us. I’m looking forward to reading Sameh’s presentation on the CTA’s website: he promised he would include references to all the enticing programs he described. Our last presentation on Saturday was “Vetting Clients—How to Use Payment Practices and Other Sources to Prevent Late or Non-Payment”, by Ted Wozniak: a good description of how to use Ted’s Payment Practices site (and other resources) to avoid poor payers. On Sunday we took part in two workshops: “Create Focus and Simplify Your Marketing Efforts with a Marketing Plan for Your Translation Business”, by Tess Whitty, and “It’s All About Style: Creating Consistent Documents for Clients” on how to create a style sheet to improve consistency, by Alice Levine. This session on creating a style sheet was an eye-opener, for me: I didn’t know that the best way to create a style sheet is not while translating, writing, or editing, but as a separate step, when all your attention goes to deciding what should go on the style sheet. After the exercises we did during the workshop, now I see why: it’s important, and deserves full, undivided concentration. 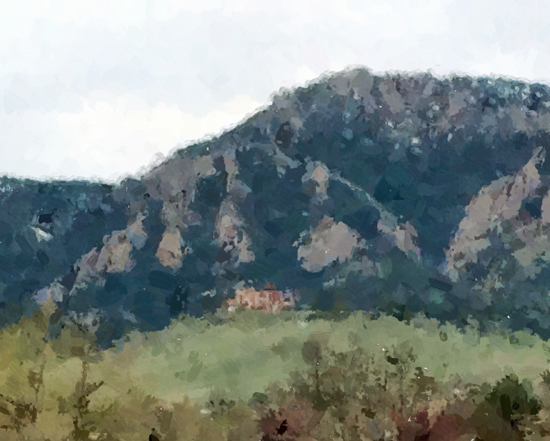 The setting, once again at the National Center for Atmospheric Research in the foothills above Boulder, contributed stunning views and a beautiful mountain environment just outside the conference. Thank you to the CTA’s organizing committee for a job well done! P.S. I haven't mentioned the presentations that I didn't get to, but if anybody who has attended them would like to send me a brief recap of what was said there, I'd be happy to add to this post. What a great summary of the conference! I saw some of the same presentations you did, but some different ones too, so it was good to get your summary of those. And thanks for the pic of me, Tess and Corinne! Thanks for the lovely post, Riccardo! It was such a great day and we are really lucky to have such a dynamic association here. 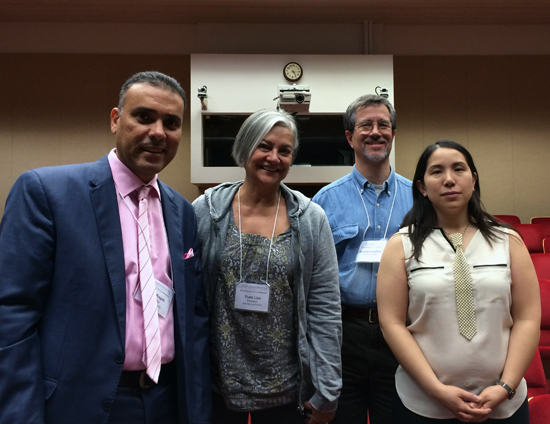 Thanks Ricardo for such a wonderful article, and we all enjoyed a wonderful conference. Thanks to CAT and everybody, so that I do not forget any name. You were all simply amazing and very hospitable. Pleased to know about this Annual Conference. I attended a similar conference two years ago at venue Houston and was quite impressive. Now, we have shifted to Orange County so couldn’t attend these conferences.